So…. it has been raining here for 2 solid days. All of the snow and ice is north of us, so all we have had is rain and cold and cold and rain all.day.long. yesterday and today. I’m over it and ready for SPRING! and Nike shorts! I had a customer bring me some Nike shorts to monogram this week, and after asking around to see if anyone had done them before, I “figured out” which stabilizer to use. After I was done, I realized it might be handy information for those of you out there who haven’t done any yet. I used water soluble “solvy” on top. Yes, it’s water soluble, but I just pick and pull it off when I’m done. I used Waffle Tearaway on the bottom. As you can see, I hooped it all together and also used a little Sulky KK2000 spray adhesive to “stick” the tearaway to the underside of the shorts to keep it in place. This type of tearaway is a little thicker than the standard iron on tearaway, which is like paper, which I normally use on towels and bibs. 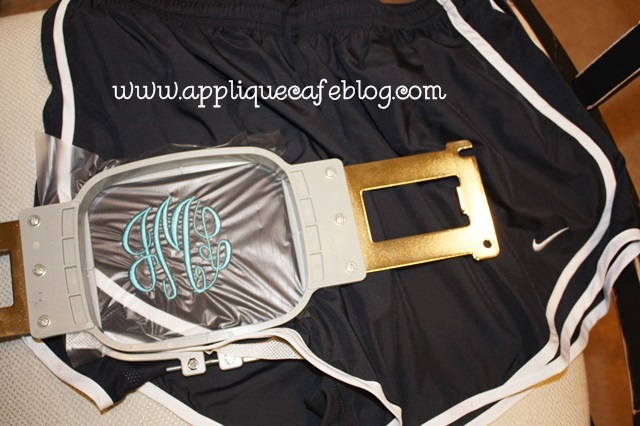 Nike shorts are made of a thin polyester type material, and I wanted to avoid any puckering with the weight of a monogram. I considered using cutaway (medium) but went with the tearaway and it did fine. 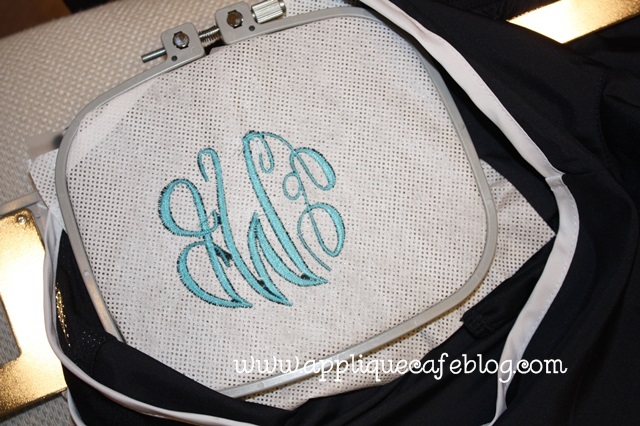 Do you notice anything “off” on my monogram below? There is no bobbin thread showing, which means my tension is off. This doesn’t affect this particular monogram, but it might if you were working on another project. 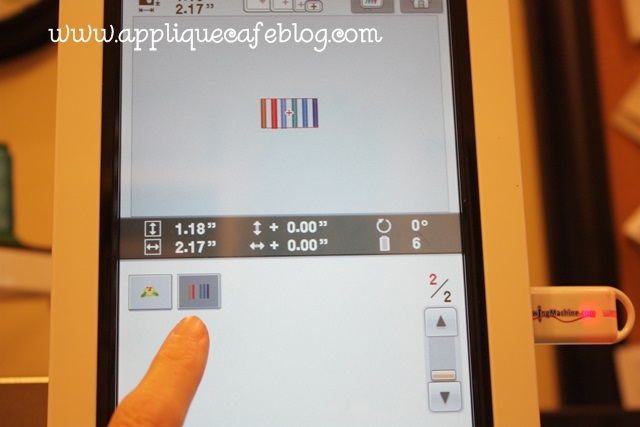 I will show you in a minute how to check your tension on a 6 needle machine. 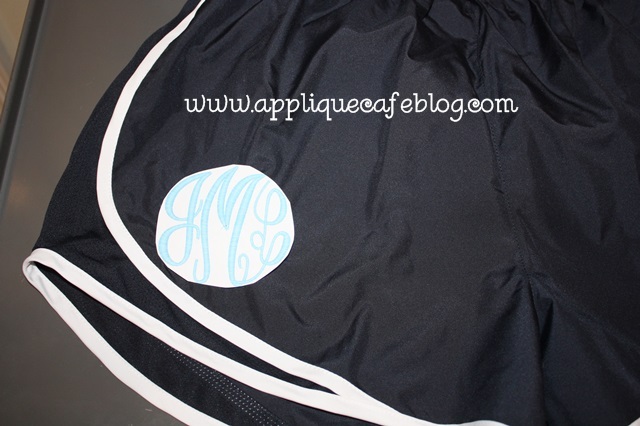 Before I actually did the monogram, I wasn’t sure what size I should do. I looked around on Pinterest and saw a bunch of monogrammed Nike shorts in a variety of fonts and size monograms. I was between a 2.5″ and a 3″ monogram, so I printed both and cut the monogram out to see which size looked best, and also it helped with placement. I used Monogram Wizard Plus “Master Circle” as my font. MWP has a print option which comes in handy when you are deciding size and placement. 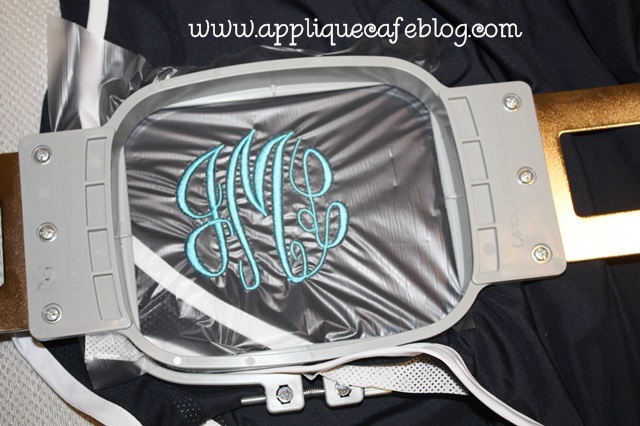 I went with the 3″ monogram after consulting with my customer! Here’s the finished product! 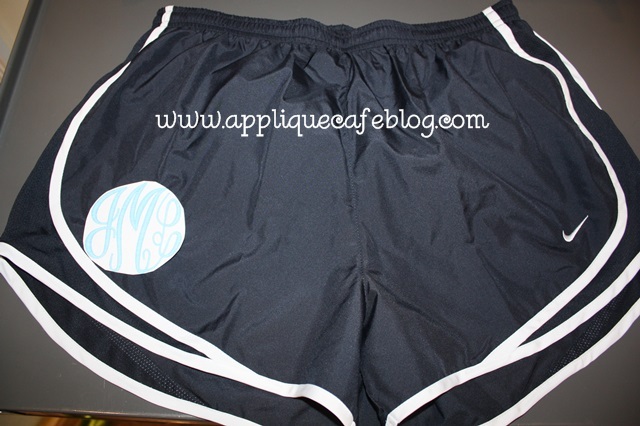 As I mentioned, if you search “monogrammed Nike shorts” on Pinterest, you will see all kinds of fonts and placement. I love the way these turned out! 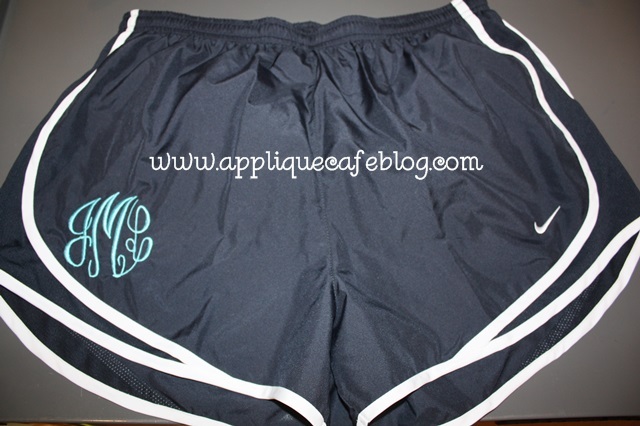 These are navy with a turquoise monogram. Hot pink would have been cute too! Now on to my tension issue. 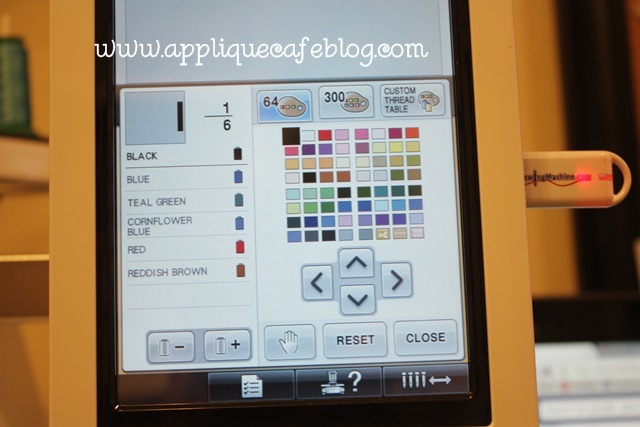 I have a Brother PR650 6 needle embroidery machine, which comes with a handy dandy tension test feature. 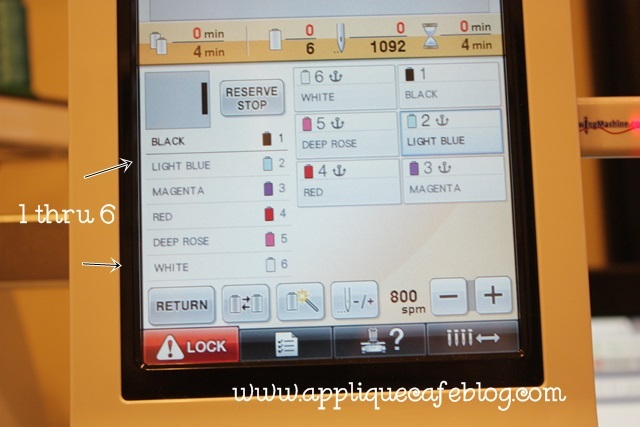 On machines such as mine, your tension is controlled by knobs on top of the machine. Looking at your Home screen, select the button with the bird on it. 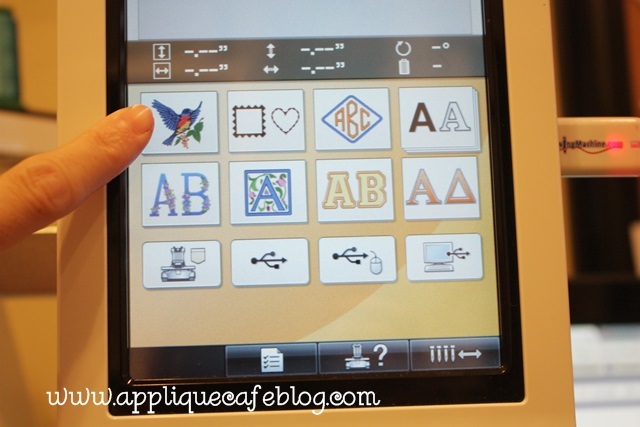 It will pull up some embroidery designs built in to your machine. Go to page 2 and you will see the tension test. 6 color bars or lines = 6 needles = 6 thread colors. As you can see below, I’ve assigned my colors and it shows the 6 steps with needles sewing in order to test each needle, 1, 2, 3, 4, 5 & 6. Here are the results of my first tension test. Again, no bobbin thread showing. Since all 6 rows are lacking in bobbin thread, I have to assume there’s an issue with my bobbin! Had it been only 1 needle, then I could assume there was an issue with that 1 needle and the rest were fine with no bobbin issues. After taking my bobbin case out, I quickly found the culprit. 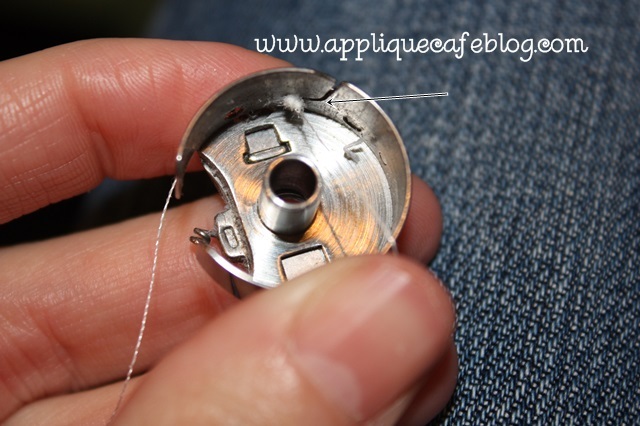 It looks like the thread is caught and is balling up before it can come out of the bobbin case. Bingo! 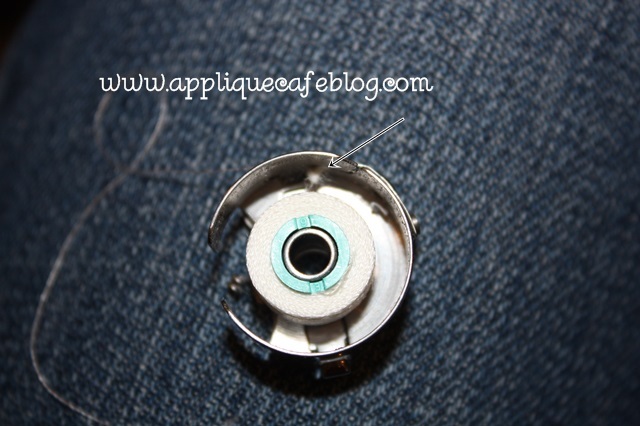 I removed the “knot”, re-threaded and put my bobbin case back in. I use Magna Glide Prewound L bobbins. Tension test #2 results are below, and you can see the bobbin thread. 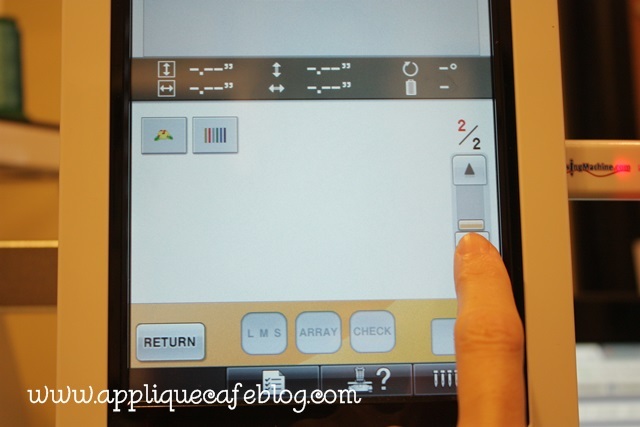 A good rule of thumb per Steve at Sewingmachine.com, is 1/3-1/3-1/3. 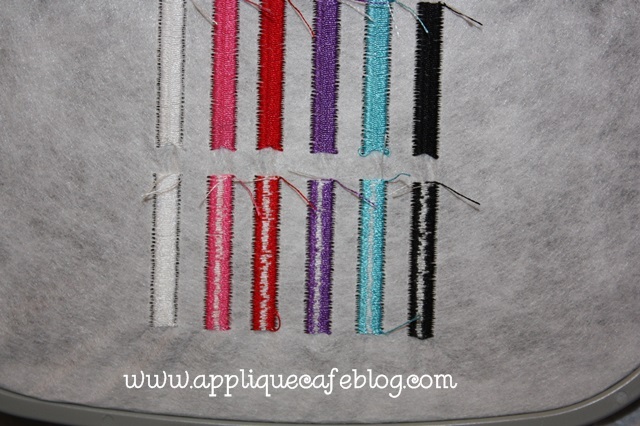 1/3 colored thread, 1/3 bobbin thread in the middle and 1/3 colored thread on the other side. Mine is not exactly 1/3 each but it looks much better and I can work on the tension up top! I hope that was helpful ~ both the stabilizer with the Nike shorts AND the tension test! 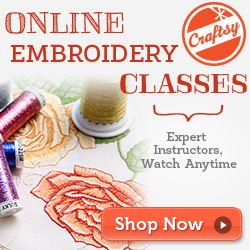 You can find more helpful videos regarding 6 needle machines at Sewingmachine.com! 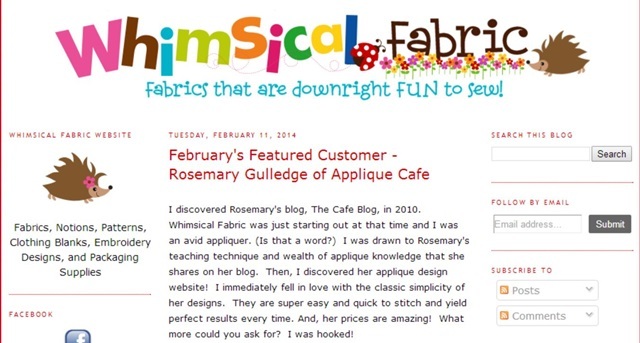 Before you go, check out Whimsical Fabric’s latest blog post! I had the pleasure of being their “Featured Customer” for February! 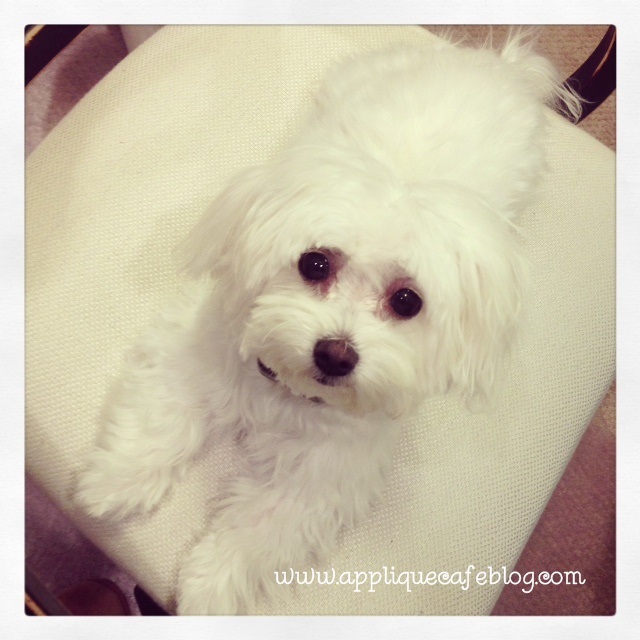 Find out more about me and running my own business! 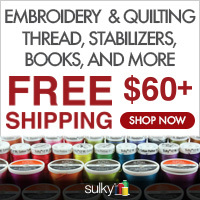 WF has great fabric, shipping supplies and sewing patterns for those of you who sew. 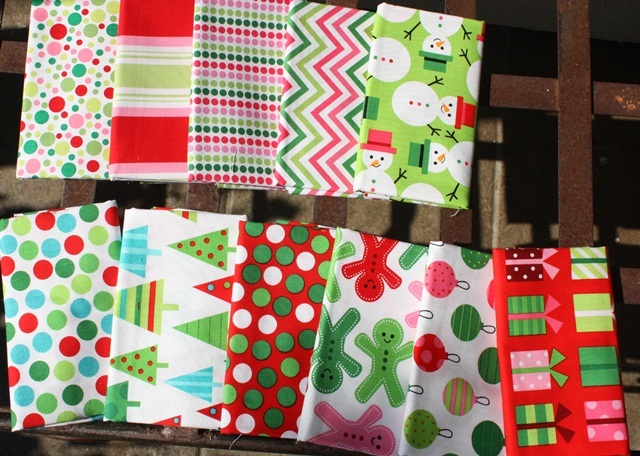 She also hosts a “Sew Along” each month so check out her blog to find out more. She’s also on Facebook and has a sew along Facebook group if you are interested in joining! Basically she picks a pattern to sew each month and blogs about each and every step. There are discussions on Facebook and lots of photos! 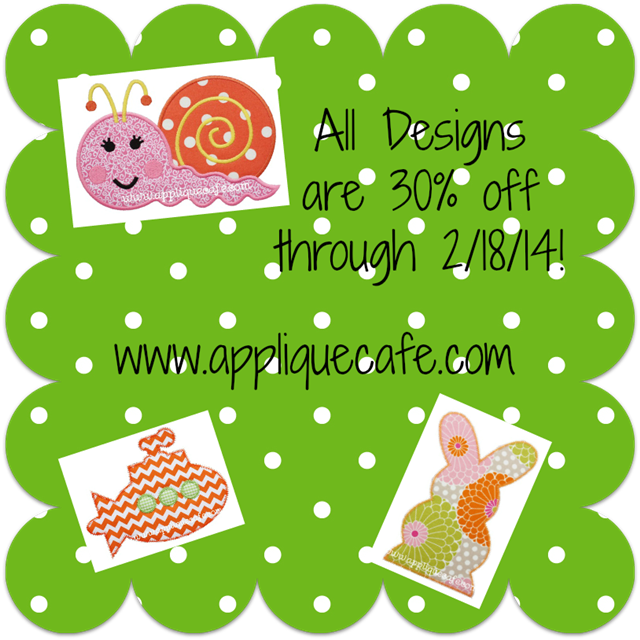 Lastly, all of our designs are on sale through Tuesday, February 18th at Applique Cafe! Below are a few new ones listed last week. I’m off to snuggle with my Maggie. She is scheduled for surgery in the morning to be spayed!! She has already begun her first heat cycle (eeek!! ), so the timing was perfect and we’re anxious to get through tomorrow. Have a great rest of the week! We are hoping for some sunshine tomorrow! Happy Friday! 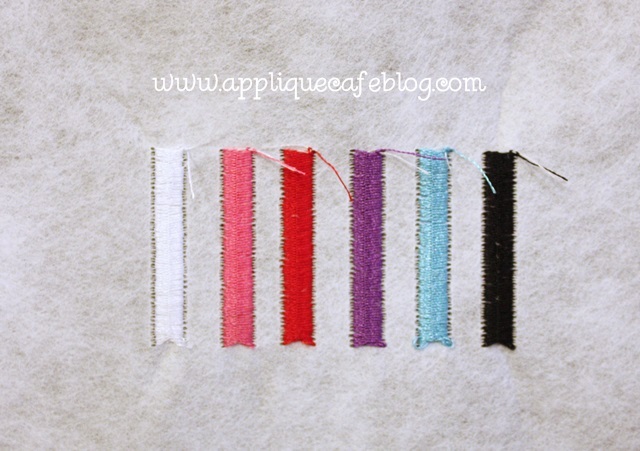 I have been meaning to do a post on all the new fabulous fabrics I’ve gotten recently. Here it is! I posted this photo already on Facebook. 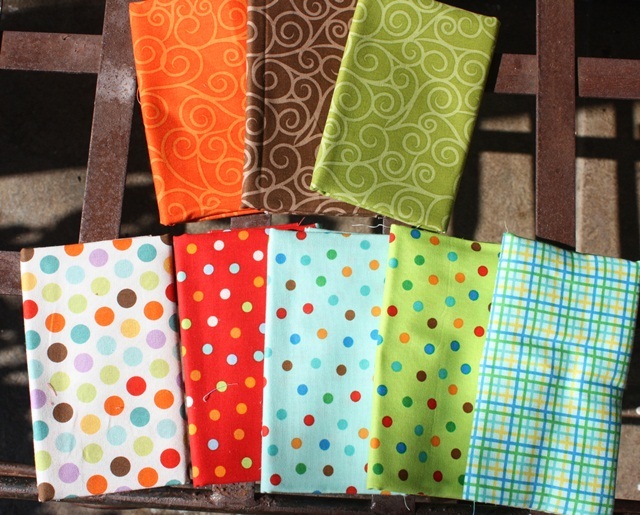 The dot fabrics below are all from TJs Fabric (Opp, AL). Most of these are Michael Miller “Kiss Dots” and I think the brown and red are “Dumb Dots”. If you go to TJ’s website and click on Online Store, then Newest Editions, you’ll find most of these. 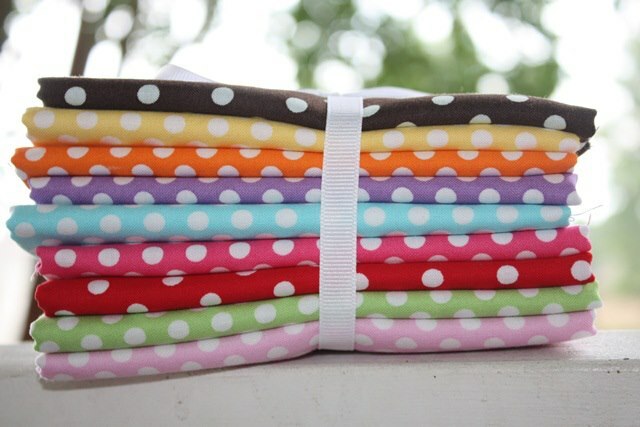 I LOVE any and all polka dot fabrics and use them in almost all of my designs, especially the girly ones! 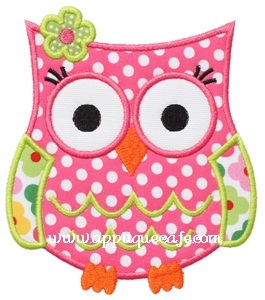 I used the hot pink in our latest Owl 5 (MUST SEE) design listed this morning. These are Robert Kaufman fabrics. 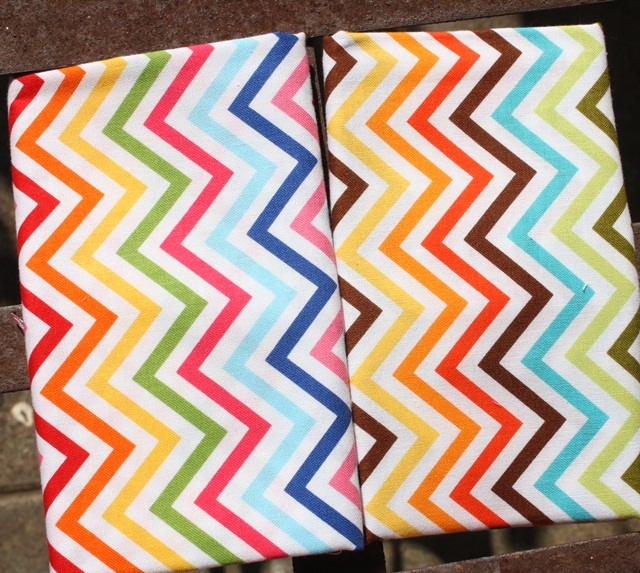 LOVE LOVE LOVE the Chevrons which are SO popular right now! 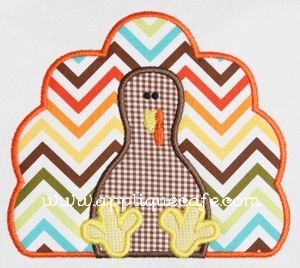 Top row 4th over Chevron is the one I used last year in our Turkey 4 design! Again, all from TJs and these can be found under Newest Additions as well! More Robert Kaufman (Jingle Holly). Top left dot is Michael Miller (Santa Play Dot) which has been very popular over the past couple of years! 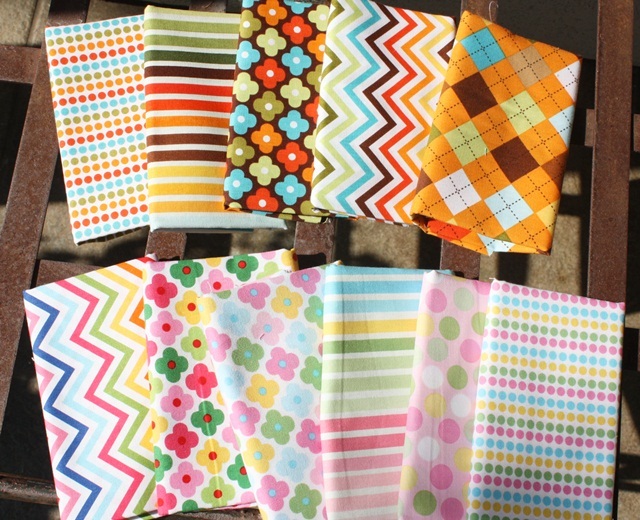 These top swirly fabrics are Riley Blake ~ great for fall! 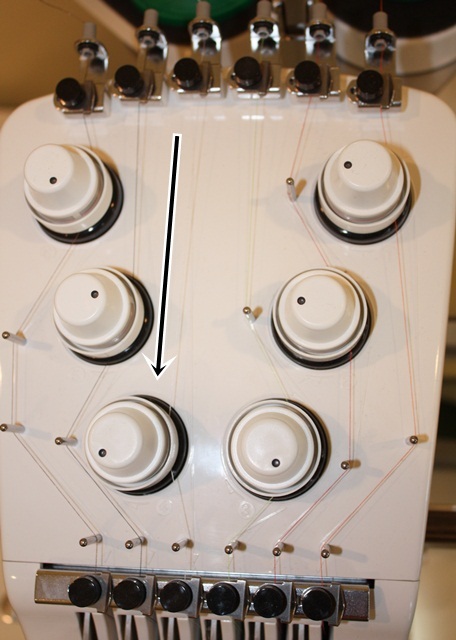 Bottom middle dots are Moda as well as the right plaid. Bottom left dot is Riley Blake ~ super cute colors! Again, all TJs and all should be listed under Newest Editions! CHEVRONS!!!!!!!!!! They are THE hot fabric right now! Hot pink and green I’ve had for a while (I think I got them at InTown Quilters in Decatur, GA) and are Michael Miller. The Brown, aqua, yellow are all Riley Blake. 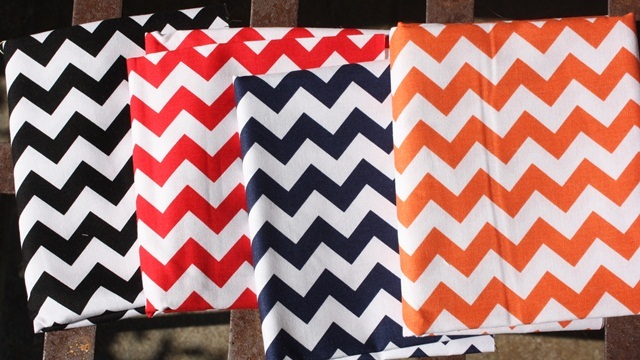 You can find Chevrons at both TJs Fabric and Whimsical Designs. 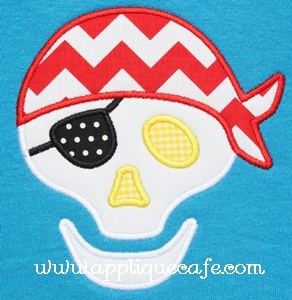 You can get 5% off at Whimsical Designs with my special code: ACe6ecea7394 through September 30th! The discount can be stacked on other sales too! These Chevrons are smaller than the above ~ all Riley Blake! 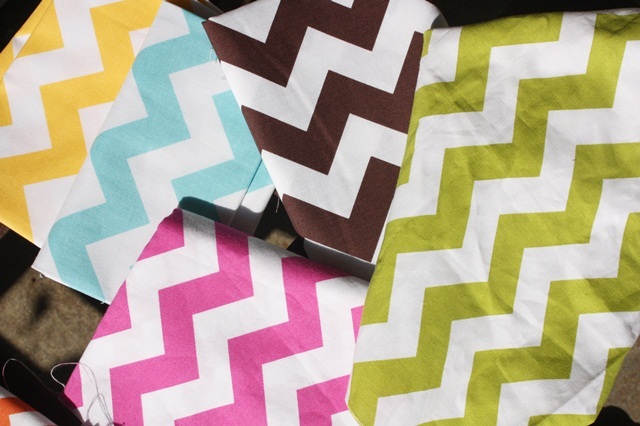 I don’t know if we can all thank Isaac Mizrahi (2011 Target craze) for the chevron phase or what? Thank you whoever! I love them! 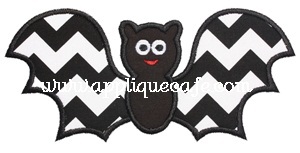 I used the black on our new Bat design and the red on our new Pirate Skeleton design, both listed today! These are Robert Kaufman (says Ann Kelle for Robert Kaufman). LOVE these!! 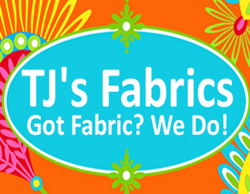 Again, check out TJs Fabric or Whimsical Designs for these great fabrics for FALL and CHRISTMAS! Really makes me want to start on Christmas designs! Have a great weekend! 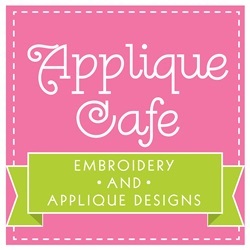 I have been working all week on a large baby order (be on the lookout for my next post) and sampled 5 new Applique Cafe designs yesterday and this morning. I just turned my machine OFF and am going to try to leave it off all weekend! It’s time for consigning the kids clothes (NEXT WEEK) and I haven’t even started…..